To Sum It Up: Zayn’s world falls apart after she watches her mother burn at the stake for allegedly being a witch. Zayn believes she has nothing left to live for when a mysterious stranger offers her a fresh start—with a secret organization of assassins. With training, she can finally hone the special abilities that have always set her apart and stirred rumors that she’s the daughter of a demon. Proving herself to the assassins won’t be easy, but Zayn is determined to get revenge against the Templar knight responsible for her mother’s death. Review: The Middle Ages hold an endless fascination for me, probably more than any other time period in history. What’s not to love about knights and chivalry and all that good stuff? Well, I happen to love all that good stuff, and when you add assassins to the mix, I’m doubly intrigued. 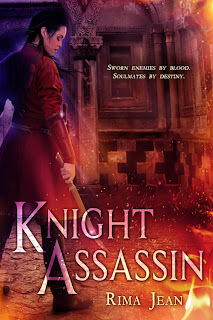 Knight Assassin features a heroine with quite an interesting backstory. Seventeen-year-old Zayn hails from a village in medieval Syria whose inhabitants are serfs to the Franks. Over the course of the novel, she crosses paths with historical figures like the Knights Templar, Saladin, and King Baldwin IV of Jerusalem. Real-life history is weaved into the narrative extremely well; it’s obvious that a great deal of effort was put into researching the period and recreating it. You truly feel like you’ve stepped back to a time of swords and crossbows and chain mail. I loved the meticulous attention to medieval detail and relished every single one. Because I’m geeky like that. Two things kept the book from breaking out of the three star range, though. First, Zayn’s powers are given rather vague descriptions. She appears to possess enhanced strength and agility, which are handy when you’re trying to become an assassin. But I didn’t find Zayn’s abilities particularly extraordinary, and that’s where I think the fantasy element of the book fell a little short. I also wanted to see Zayn do more assassinating. Most of the novel focuses on her training and then settling into her cover so she can prepare to take out her target, a Templar named Guy de Molay. That’s the issue right there—lots of build-up to the big confrontation with not enough action in between, at least for me. Although the setting was fantastic and Zayn made a pretty compelling protagonist (and I think she still would have been one even without her superhuman talents), there were times when I wished the story would pick up the pace. Overall, this was an okay read; it just needed a tad more polish in a few areas to really make it shine. All in All: If you’re a Middle Ages maniac like I am, Knight Assassin might appeal to you. It’s definitely refreshing to read a YA novel set in the Middle Ages during the Crusades. I did find the book a little too light on the “assassin” part of the title, though. I think this one would have been fine just as historical fiction. I like my fantasy elements thoroughly developed, too, and they're pretty light here. It always disappoints when hailed assassins don't engage in much assassinating! But I love history an definitely the Middle Ages, so this sounds like something I might enjoy! The time period was very well researched, and I really liked that aspect of the book. But I definitely felt that Zayn needed more targets to assassinate, lol.